Migrating from Oracle to PostgreSQL has become more and more popular as prices for commercial database licences started to go through the roof in recent years. So why not move one of the world’s best Open Source products and start to benefit from the power of PostgreSQL? Cybertec Enterprise Migrator is a radically new approach and offers fast Oracle to PostgreSQL migration. In contrast to most other solutions such as ora2pg, Cybertec Enterprise Migrator has a graphical user interface, which is easy to use and allows you to keep trac of your project. 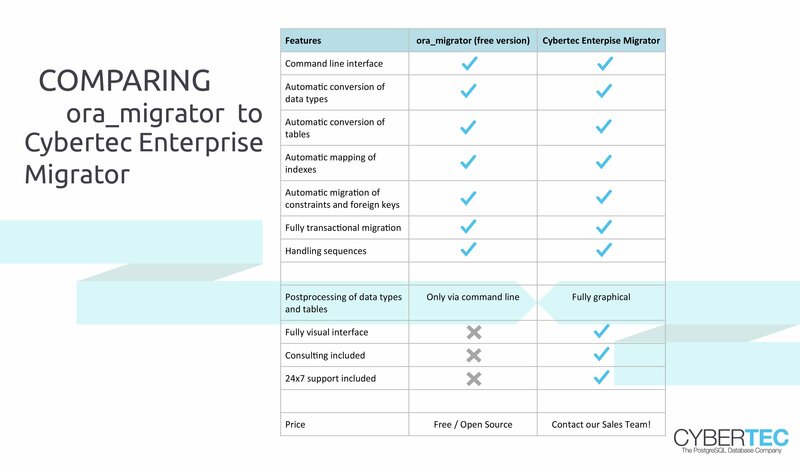 Cybertec Enterprise Migrator is even able to migrate “moving targets”. If tables or columns are added to Oracle during migration, our toolchain can automatically adjust and move those new objects to PostgreSQL as needed. Moving to PostgreSQL has never been easier and more professional. To start the migration project, connect to PostgreSQL and to Oracle. Now that Cybertec Enterprise Manager knows about your desired systems, you are ready to go. 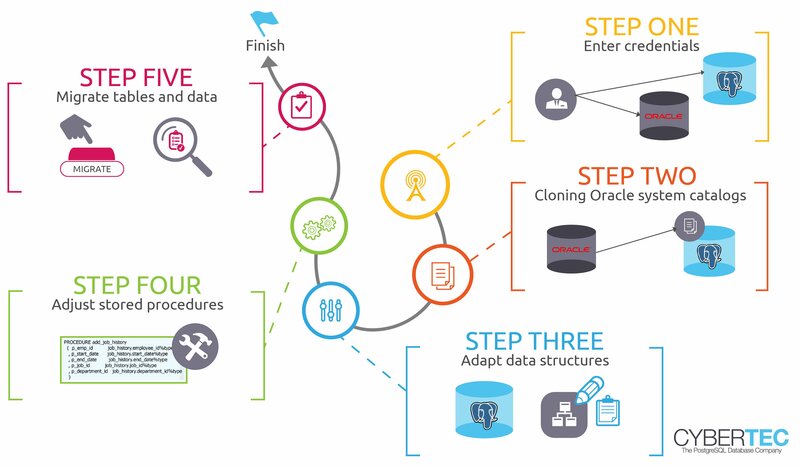 The first thing our tool does is to clone the relevant parts of the Oracle system catalog and store it in PostgreSQL. Data type conversion, etc. will happen at this stage. Once the first migration step has been performed automatically (data type mapping, etc.) you can visually adjust your data types, constraints and alike. Note that PostgreSQL has many more options than Oracle and some manual tweaks can be helpful. You might also want to exclude tables from the migration process entirely. After taking care of tables and columns, you can turn your attention to procedures. Cybertec Enterprise Migrator will list all procedures and offer a visual editor so that you can move code from Oracle to PostgreSQL quickly. We do not attempt an automatic conversion at this stage because experience shows that this usually leads to unexpected errors. Once procedures and tables have been tweaked, it is time for the big moment. Simply press a button and check if the migration process is successful. Cybertec Enterprice Migrator is based on ora_migrator and offers a visual editor as well as other features. It is a Cybertec product and can be obtained by contacting our sales team. We sell Cybertec Enterprise Migrator along with consulting services as well as support to make your migration as speedy and as fast as possible. Contact us today to learn more about our migration services and our professional enterprise tool chains.